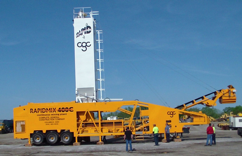 When Complete General Construction needed a Roller Compacted Concrete Plant for their Ohio Turnpike Paving Project, they wasted no time and consulted with Gulf Atlantic Industrial Equipment to discuss the best Roller Compacted Concrete plant for their application. With more than 40 years of experience with RCC, concrete, and aggregate equipment supply, with product application and in-the field experience, Gulf Atlantic is the dealer of choice when you need a wide field of knowledge about industrial equipment for your specific application. The Ohio Turnpike Pavement is being systematically replaced in 48 five-mile long sections. The pavement design is comprised of a composite pavement with lime-stabilized subgrade, granular base course, and non-reinforced RCC pavement and shoulders. 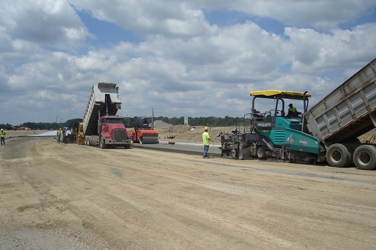 Roller-Compacted Concrete has characteristics similar to concrete, and less expensive than asphalt. It has been shown to be tough in the harshest conditions, fast to apply, and economical for taxpayers and project developers. It shares the same basic ingredients as traditional concrete: cement, water, and aggregates. But, instead of being transferred to a project in mixer trucks, it is mixed on site via the pugmill twin shaft mixer located on the portable Rapid Mix 400C plant and discharged to dump trucks for delivery to the job site. There it is placed using a specialized paver with a vibratory screed and compacted with vibratory rollers. On a first cost basis, RCC can be less expensive than asphalt and due to its strength and durability; its maintenance costs over the lifetime of the pavement are substantially reduced providing long serviceability with minimal maintenance. Because of its low water-cement ratio, RCC typically has high strengths similar to, or even greater than, conventional concrete. RCC’s high-strength properties combined with ease of construction and high rate of production often make RCC more economical than a flexible pavement. Additionally, more than 20 years of exposure as logging roads in cold climates have demonstrated that RCC has adequate resistance to freezing and thawing, a conclusion verified by the U.S. Army Corps of Engineers in their evaluations of RCC Paving projects. General Construction of Columbus, Ohio for the on the jobsite. 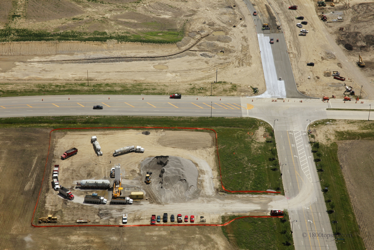 company’s Turnpike Improvements project, May, 2011.
on site ready for setup and operation. Once the RapidMix International RCC Plant arrives on a jobsite, it is literally less than an hour before it is ready to work. Both the Rapid Mix 400 and the Rapid Mix 600 C have been designed to be totally mobile and completely self-contained with their own power source. They are also completely self erecting, using the hydraulic system to change the plant from its travel mode into a fully operational plant within a few hours. Utilizing a continuous mixing system these plants mix from 400- 600 tons per hour depending on application. Feed rates are fully adjustable for the aggregate, cement and water systems. The plants are designed for any mixing application where a cement or binder needs to be mixed into a base material. Since its inception in 1928, Complete General Construction has grown into one of the industry’s specialists in highway construction heavily involved in major Ohio interstate construction projects such as I-71, SR-315, I-670, I-170, and also includes bridge construction/repair, paving, site preparation, highway and underground electric, street lighting and signal layout, airport taxiway construction and custom crushing/recycling to its staples of highway and sewer work. When a highway construction expert like Complete General Construction selects Gulf Atlantic Industrial Equipment and the Rapid Mix 400C as their dealer and RCC plant of choice, you know they have selected the best the industry has to offer. To contact Complete General Construction visit their website at: www.completegeneral.com. Below are several photographs of the jobsite and process used to complete projects using the RapidMix 400C Continuous Mixing Plant for the production of RCC Concrete. While RCC Is Placed, Roller Compactors Compress it into Place. 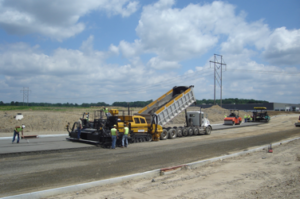 Roller Compacted Concrete Delivers Speed, Precision, Strength, & Durability. If you would like more information on the Rapid Mix International Continuous Mixing Plants for RCC Concrete, or would like to request a copy of our Features and Benefits of Roller Compacted Concrete Brochure or our DVD on Rapid Mix International RCC Plants, please contact the RCC Plant experts at Gulf Atlantic Industrial Equipment, Inc. at (800) 792-7427, (352) 628-6674, or email us at Info@GulfAtlanticEquipment.com. We also invite you to visit our website at www.GulfAtlanticEquipment.com for our complete line of equipment and company history. When you want the best equipment for your next project, call Gulf Atlantic and “Let Us EARN Your Business”.